Moringa Pure is a supplement design to promote overall health and nutrition, while also encouraging healthy, sustainable weight loss. Moringa Oleifera Extract contains a high concentration of vitamins, minerals, essential fatty acids and amino acids. These all help to provide support for healthy functioning of organ systems, and the balancing of hormones. 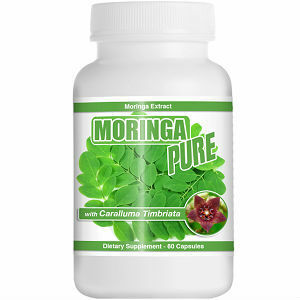 Moringa Pure differentiates itself from competitors by adding Garcinia Cambogia and Caralluma Fibriata to its formula. HCA is said to help with weight loss and Caralluma Fimbriata is said to help with appetite suppression. However, elsewhere on the manufacturer’s site we are told that the capsules contain 400 mg so there is a contradiction between the label and the website, which is a concern. The company recommends taking two capsules per day. Moringa Pure should not be taken by women who are pregnant or breastfeeding. In some studies it has been shown to have anticoagulant properties, so individual suffering from blood disorders should consult a doctor before use. Excessive amounts of Moringa Oleifera have caused some health problems, so it is important not to exceed the recommended dosage. At time of writing, Moringa Pure was available through the manufacturer’s website for $39.00 for one bottle of 60 capsules; buy two get one free ($79.00); and buy three get three free for ($119). The manufacturer also has products available through Amazon and other online pharmacies. The company offers a 60-day money back guarantee. There are no product reviews available for this specific dosage and formula, but searching for other similar products by this manufacturer found positive reviews that demonstrated results with very few instances of side effects. While the health benefits of Moringa Oleifera seem clear, there are a couple of “red flags” related to this particular product. The company’s site lists at least two different quantities of Moringa extract per capsule, so it is unclear exactly how much of it and the other two plant ingredients are in each capsule. This, combined with the lack of reviews make it unclear how effective this product is. Michael Hall	reviewed Moringa Pure	on May 14th	 and gave it a rating of 3.5.